New and convincing scams are invented constantly with the aim of luring people into providing money or personal identity details. They can be in the form of an email, pop up, use message services – social media or texts or phone calls. Do your research through independent and verified means to confirm who you are actually dealing with. Never provide personal information to people you don’t know and look out for others around you who are more vulnerable in the community, such as children and the elderly. Protect your devices by installing up to date anti-virus software and ensure passwords are never provided to others. Threats and extortion from scammers pretending to be from government agencies such as the Australian Taxation Office, Centrelink, Office of Fair Trading and debt collection agencies. These can involve persistent calls with aggressive and persuasive tactics to obtain money. Legitimate agencies will never request that you deposit money into other personal bank accounts or purchase Western Union money orders, iTunes cards in order to repay a debt. Always contact the agency direct for advice – do not use the contact details supplied by the suspected scammer. Unexpected winnings in lotteries, promises of employment such as working from home for fast ways to make money, fake charities and investment schemes. Identity thieves will use varying tactics such as impersonating government agencies, financial institutions even making threats of police action or debt collection in order to obtain your personal details leading to other fraudulent activities such as taking out credit cards, bank accounts or loans in your name. Romance scams take advantage of vulnerable people looking for romantic partners. Often it begins with innocent communication and quickly turns to requests for financial assistance for reasons such as illness in the family, medical bills or plane tickets. 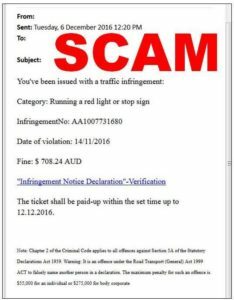 There have been multiple reports of imitation/scam infringement notice emails claiming to be from Tasmania Police. These emails address the individual by name and are often referenced by US style terminology such as ‘violation’ rather than ‘offence’ and the date format being month, day, year (mmddyyyy) rather than day,month,year. The imitation/scam emails also include a link requiring the recipient to download the notice. These emails are a scam and should be deleted. Do not open links as there may be viruses. An example of the imitation/scam email is pictured below. Legitimate emails from Tasmania Police do not contain links and will not come from Hotmail or other free email provider accounts. The infringement notice will contain the correct name of the driver, correct vehicle description and location of the alleged offence. Tasmania Police has an option to email infringement notices; however this will only happen if the recipient has had face-to-face contact with a police officer, has provided their email address, and agreed to receive email correspondence. The infringement notice will also contain the Tasmanian Government logo and barcode for use by Service Tasmania, as well as contact information for Tasmania Police Traffic Liaison Services, if a member of the public requires confirmation or assistance with the infringement notice. This page -- https://www.police.tas.gov.au/what-we-do/fraud-ecrime-scams/police-infringement-notices-email-scam/ -- was last published on May 11, 2017 by the Department of Police, Fire and Emergency Management.